When the 15-year-old Lyudmila Belousova stepped out on to the ice with Oleg Protopopov for the first time, there was no reason to suspect that the result would be anything more than run-of-the-mill. But as the two figure skaters swept gracefully out across the expanse of the rink, it gradually became clear to those watching that something very special indeed was happening. Miraculously, the two athletes had immediately established an innate and wonderful complicity, their movements, rhythm and timing, complementing each other to perfection. Belousova and Protopopov never looked back, taking competition after competition by storm with performances of superlative and bewitching quality. They were inventive, too, creating a number of movements, including the so-called "death spiral". The couple had to wait until 1962 before getting into the top three, and a further two years before they won their first gold medal at the Innsbruck Winter Games in 1964. 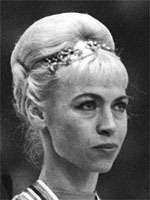 Lyudmila was 28 and Oleg 31 by this time, but age did not stop them dominating pairs figure skating for the next four years, and it was no real surprise when they won gold again at the 1968 Games in Grenoble. But those Olympics proved to be the high-water mark for the pair, and they soon found themselves sidelined by another Soviet couple, Irina Rodnina and Alexei Ulanov, whose more dynamic and athletic style became the new pairs credo. After they were beaten in the 1969 world and European championships, Belousova and Protopopov were put out to grass by the Soviet authorities and took up jobs as coaches. They continued to appear as soloists for the Leningrad ballet on ice, but the conditions were poor. On September 14, 1979, the pair took advantage of a gala performance in Switzerland to defect. Their request for political asylum was accepted and they settled in the resort of Grindelwald. They later signed a two million dollar (2.3 million euros) contract with an American touring company and travelled widely in the US, showing off their classic, sublime skills.